I don’t know why, but I keep wanting to eat chilli? It might be the dark nights, and the grey skies that has me yearning for a big pot of fiery, beany, tomatoey loveliness – and this recipe has chocolate, so whats not to love! This is another from Katy Beskow’s 15 Minute Vegan Comfort Food (again, I can’t recommend this enough). 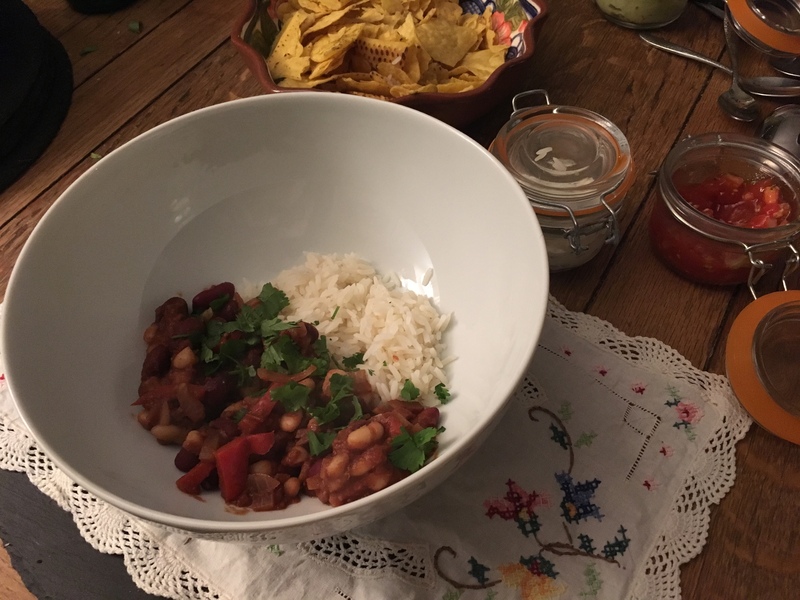 This chilli freezes perfectly, so whip up a pan, enjoy a portion and pop the rest in the freezer for evenings when you have less than 15 minutes to cook. Also, be sure your chocolate is dairy free if you want the vegan version. Add the chopped tomatoes and onion to a large saucepan over a medium– high heat. Throw in the red pepper, celery and sweetcorn, and cook for 2–3 minutes. Spoon in the cocoa, chilli powder, sugar, smoked paprika and cinnamon. Stir through the kidney beans and cannellini beans until combined, and cook for 12 minutes, stirring frequently while the chilli bubbles away. Remove from the heat and scatter with the spring onion, coriander and lime juice. Sprinkle over the dark chocolate just before serving.